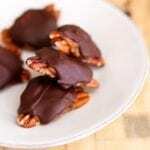 These homemade turtles are made with five simple ingredients yet still amazingly decadent and taste just as good, if not better, than the store-bought candies. 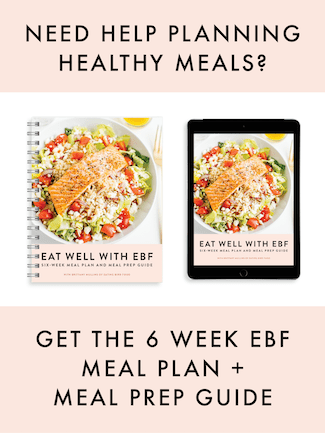 They’re also better for you! I’m quite confident that my nanny (my grandmother on my mom’s side) introduced me to Turtles at a very young age. They are her favorite candy and she pretty much always has a box on hand. She likes to share so I’ve eaten my fair share of Turtles growing up. 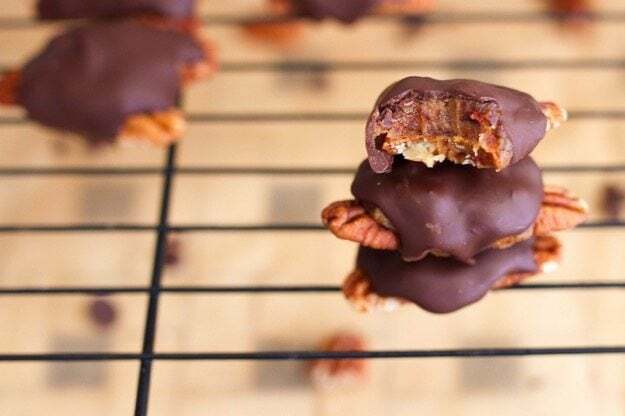 The combo of crunchy pecans topped with gooey caramel and smooth, rich chocolate simply can’t be beat. I can definitely see why nanny loves them. 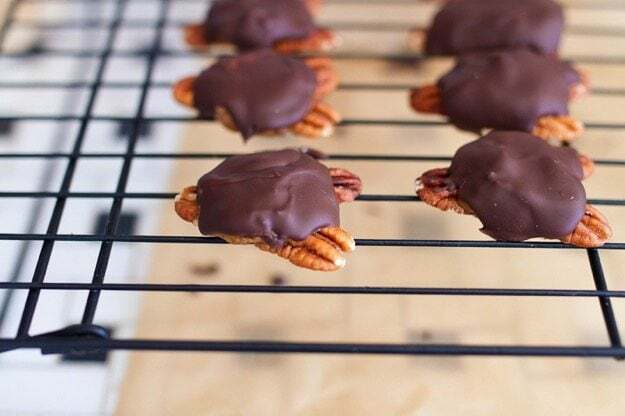 After seeing a few recipes for homemade turtles around the web I thought it’d be fun to make my own version — a bit healthier with Medjool dates instead of caramel and dairy-free dark chocolate chips for the chocolate. Medjools have a lovely caramel flavor and sticky consistency so I knew it would work well. What I didn’t realize is just how easy the homemade turtles would be to make. 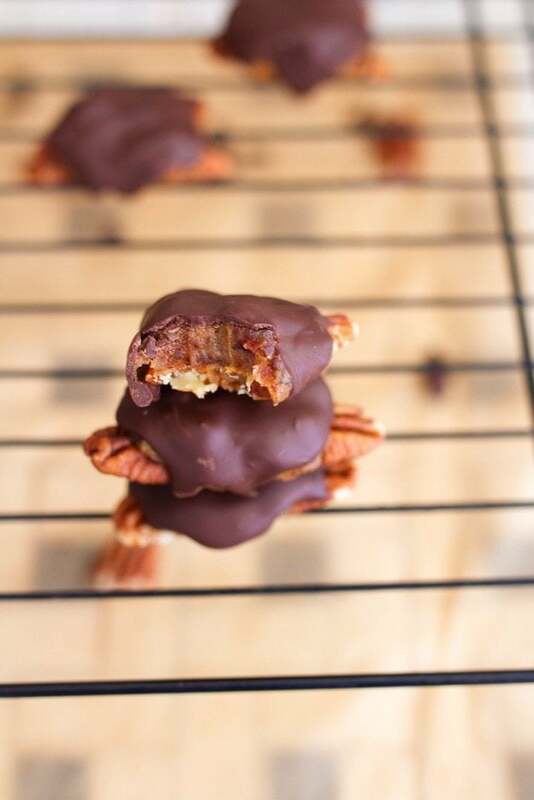 Seriously, it’s kind of an issue because now I want to make turtles every night for dessert. The first step involves processing the Medjool dates in a food processor with a little sea salt until they form a sticky ball. 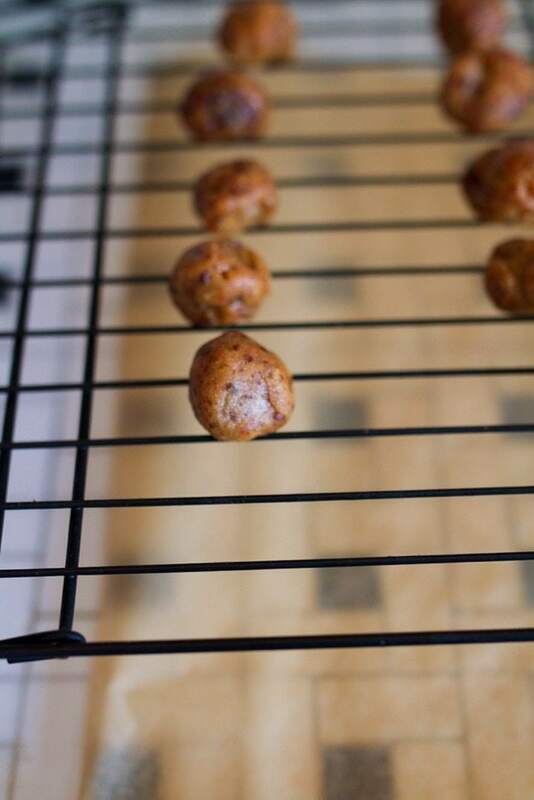 You put the sticky ball into the freezer to harden up and get a bit less sticky, take it out and form a bunch of small date balls. 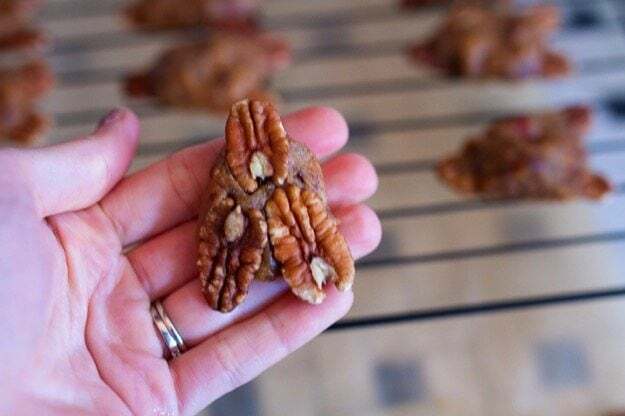 From there, you grab your pecans and place three on one side of the date ball — one at the top (that’s the turtle’s little head) and two at the bottom for the legs. As you add the pecans you flatten the date ball a bit and that becomes its back. 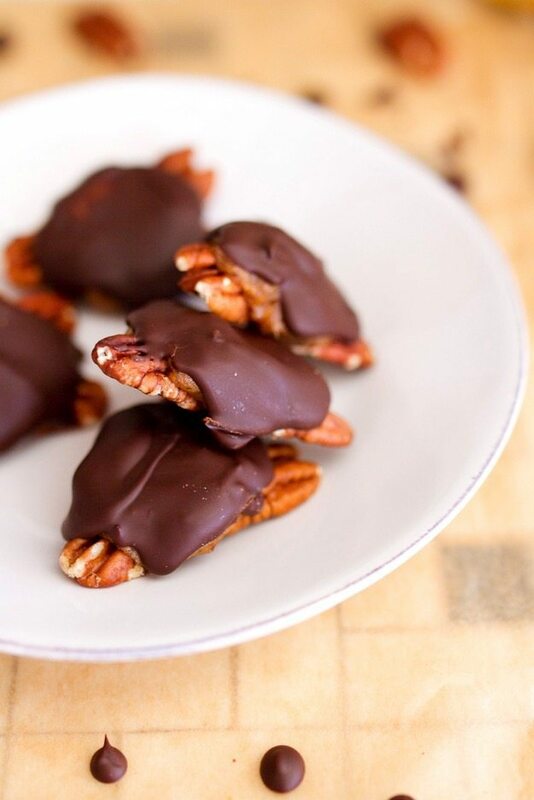 Once all the turtles have the pecans added, you cover them in melted chocolate to make their shell. Place them in the freezer so that the chocolate can set and you’re done! They come out looking like the cutest little turtles you’ve ever seen. And they taste out of this world good. 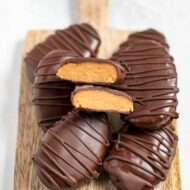 The date caramel is gooey and a tad salty while the the chocolate and pecans a buttery texture and rich flavor. They taste even better than how I remember store-bought Turtles tasting! Place dates into the bowl of a food processor and pulse a couple times. Add sea salt and pulse until the dates are completely chopped and form a large ball. The date mixture will be very sticky at this point. Using plastic wrap to cover your hands, remove ball from food processor, wrap it with plastic wrap and place in the freezer for about 1 hour. This step makes the date mixture much easier to work with. It becomes harder and less sticky. Remove date ball from freezer and unwrap. Pinch off small pieces of the date ball and roll into small balls. Place on parchment paper or a cooling racking. 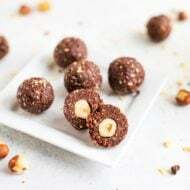 Once you have all the balls made, start adding three pecans to each ball in a triangle pattern with a little of each pecan sticking out. As you press the pecans the date ball will flatten out a bit. 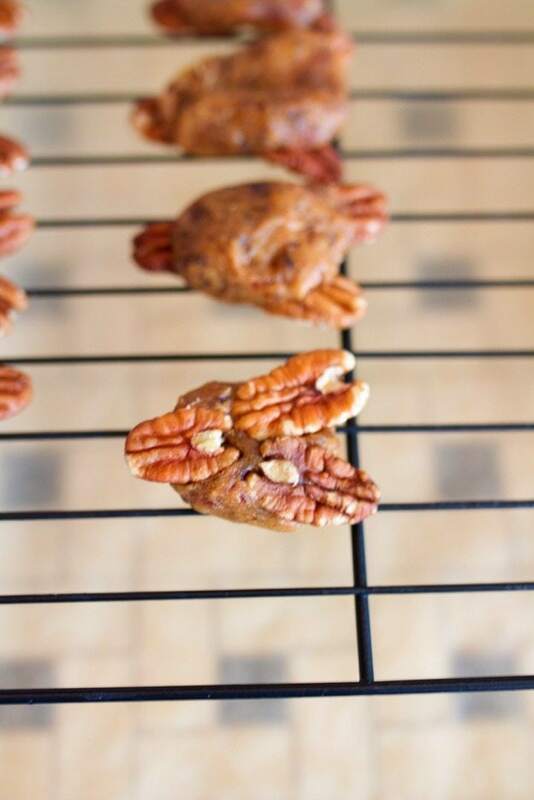 Lay each turtle pecan-side down on the parchment or cooling rack. 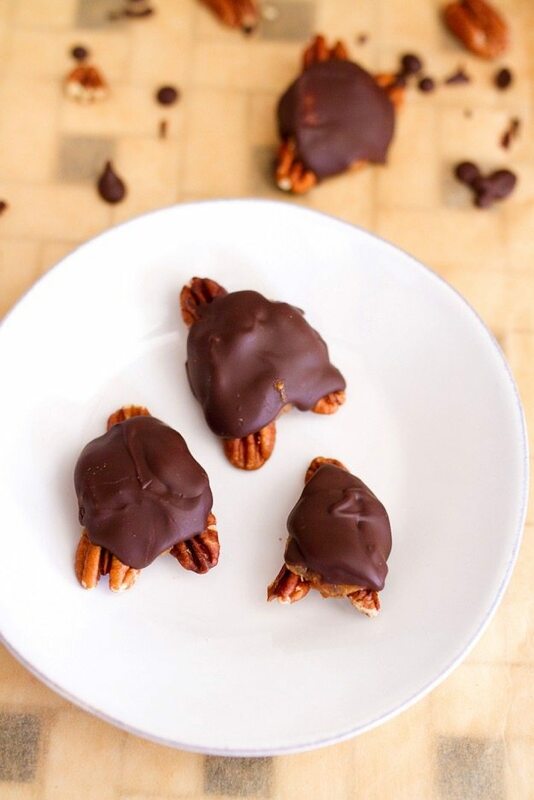 Using a spoon cover each turtle with melted chocolate. Once they’re all covered, move the turtles into the freezer to allow the chocolate to set up. This should only take about 10-15 minutes. 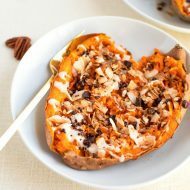 Remove from freezer and enjoy. Store any leftovers in a sealed container in the fridge or freezer. Great idea! My grandmother is also a huge turtles fan. I’ll have to make a batch for her to try too! If I don’t eat them all first ???? These taste great, only problem… stopping husband from eating them all! Thanks for another great recipe. I’m so excited to add these to my holiday baking list! Woo-hoo! Let me know how they turn out, Amelia. what is the food processor that you used in your video? I always have an issue chopping dates and and frozen bananas. Yay! You’re going to love these. I have a 9-cup Cuisinart food processor that chops up dates and frozen bananas perfectly. Here’s a link to it. worked so well for them! I hardly gave them the box of turtles and they were gone:)!